Escape election-year craziness for diving paradise in Micronesia! Join us for the dive trip of a lifetime as we dive the legendary wrecks of Truk Lagoon and the amazing walls and pinnacles of Palau on back-to-back liveaboard charters! The Truk and Palau dive sites are the stuff of legend! Hoki Mary, Fujikawa Maru, San Francisco Maru, Rio De Janiero Maru, Ulong Channel, Blue Corner, German Channel and so many more! Truk is undoubtedly a wreck diver’s nirvana! And Palau is noted for its strong current, reef-hook diving that offers large pelagic encounters and unrivaled species biodiversity! 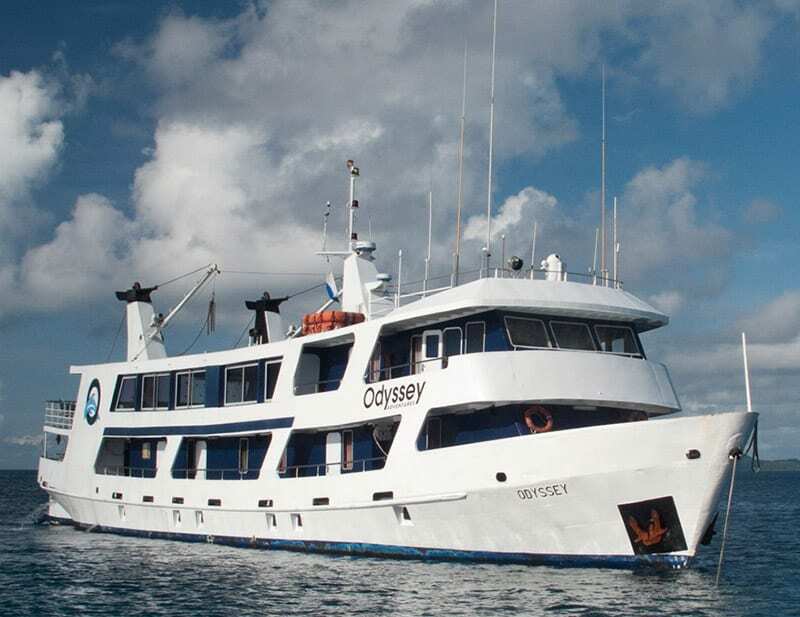 Liveaboard diving offers the ultimate in diving comfort, convenience, and value! Dive five times a day or more, with no hassles of constantly packing and unpacking your gear bags. Set up your equipment once at your own equipment station on the dive deck, and equipment handling is taken care of by the experienced crew. Plentiful and delicious meals and snacks are provided throughout the diving day. Night dives are available almost every night! A $1,000 deposit will guarantee your berth on both boats. This deposit if fully refundable up to ten (10) months prior to departure on 9/10/19. After 9/10/19 the deposit, and all subsequent payments, become non-transferrable and non-refundable. Travel cancellation insurance is strongly recommended. A second payment of $1,500 is due no later than ten (10) months prior to departure on 9/10/19 (Total payments due 9/10/19 are $2,500. These payments are forfeited for cancellations between 9/10/19 and 12/10/19, and no additional payments will be due). A third payment of $1,500 is due no later than seven (7) months prior to departure on 12/10/19 (Total payments due 12/10/19 are $4,000. These payments are forfeited for cancellations between 12/10/19 and 3/10/20, and no additional payments will be due). A final payment of $2,930 is due four (4) months prior to departure on 3/10/20 (Total payments due as of 3/10/20 are $6,930. No refunds are available after this date). US Departure Gateway to Guam on 7/10/20. Guam to Chuuk (Truk) on 7/11/20. Chuuk to Guam on 7/18/20. Guam to Koror, Palau on 7/19/20. Koror to Guam on 7/26/20. Guam to US Arrival Gateway on 7/26/20. Budget from $2300-$2600 for regular coach-class airfare. The Primary carrier throughout Micronesia is United Airlines. The Chuuk government charges 5% sales tax on diving services and also requires a $50 dive permit per diver. These fees of $219.75 must be pre-paid, and will be payable as of 3/10/20. Transfers between the Chuuk airport and the Truk Odyssey are included in your charter fee. Presently the Rock Island Aggressor does not provide airport transfers. These transfers will be pre-arranged for those joining in group airfare booking, and should be less than $50 per person. Due to airline scheduling, an overnight stay (and most of the following day) on Guam is necessary when chartering back-to-back liveaboards in Truk and Palau. A one-night, one-day stay on Guam along with necessary airport transfers, will be pre-arranged for those joining in group airfare booking, and should be approximately $150 per person. All of the above items will be pre-paid and pre-arranged prior to departure. As reflected individually above, expect an additional payment of approximately $420 on 3/10/20. Gratuities for the crews of the Truk Odyssey and Rock Island Aggressor are not included in the charter fees listed above. These are payable on board in cash or by major credit card. The Chuuk government charges a $20 airport departure tax. This cannot be prepaid, and you will be responsible for paying this in cash at the Chuuk airport on 7/18/20. Meals for the one-night, one-day stay on Guam in between the Truk and Palau charter weeks are not included above. The Palau government charges a $210 port tax. This cannot be prepaid, and you will be responsible for paying this on board the Rock Island Aggressor in cash or by major credit card. The Palau government has very recently instituted a Palau Pristine Paradise Environmental Fee in place of an airport departure tax. Presently the airlines are responsible for collecting and remitting this tax to the government of Palau, and it will be part of the airfare charged by the carrier. The Rock Island Agressor does not provide dinner on Saturday 7/25/20. Individuals are responsible for this meal, and several restaurants are located within walking distance of the marina. Please email MJG93569@yahoo.com with additional questions, and to arrange for your space on this bucket-list dive trip!